Lupe seeks to expand his horizons. Chicago rapper Lupe Fiasco tweeted South African rapper ProVerb last week Friday asking him how he could get an introduction to the SA hip-hop scene. 'Verb responded to Lupe telling him the best way would be to come down to South Africa to do shows and collaborate with artists. The veteran rapper went on to even suggest Back To The City, one of the country's essential hip-hop festivals, as one of the best ways Lupe could get clued up. Yo @ProVerbMusic what's the best way to get a proper introduction to the SA hip hop scene? I also happen to co-produce @IdolsSA which is not necessarily a hip hop show but enjoys massive viewership. Perhaps we can explore some ideas around a guest appearance, mentorship of our finalists or even collaboration with our winner. Let's discuss. Lupe, clearly intrigued, then asked what date Back To The City will be held. 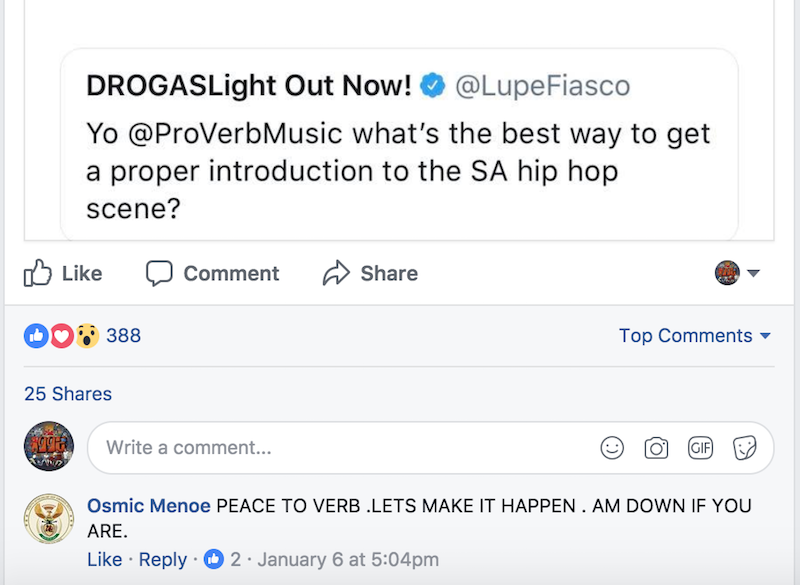 After ProVerb posted a screenshot of Lupe's initial tweet on his Facebook page, Osmic Menoe, the founder of Back To The City, commented, "Let's make it happen. I'm down if you are." I'm not speaking for all South African hip-hop heads, but I know a lot would be more than excited to catch a Lupe set at Back To The City. This is feasible, considering Back To The City now has a slot for US rap acts. eMC, Jeru The Damaja, Cappadonna, Elzhi and Skyzoo are among some of the names that have rocked the Back To The City stage. While it's not clear what Lupe's motives are, I'm crossing my fingers Lupe will be on the bill this year. You can read our South African hip-hop coverage here.